After the May 11 convictions of Avery Ng in one trial and Baggio Leung, Yau Wai-ching and their three assistants in another, it is a good time to reflect on the remaining trials of Hong Kong’s pro-democracy activists. Now is a good time for a review. In the period immediately following the 2014 Umbrella Movement, I began to track arrests and prosecutions related to it. From 11 June 2014 to 25 April 2015, 1,505 people were arrested in relation to protests against the fake universal suffrage proposal. Of those, 668 were arrested during the Umbrella Movement from 28 September to 15 December 2014, 724 were arrested before it, and 113 were arrested after it. Over the course of 2016, four more people were convicted, bringing the total by early 2017 to at least 220 prosecuted and at least 78 convicted, mostly of minor offences. All but five of those 78 convicted were given non-custodial sentences. The longest prison sentence for a demonstrator was ten months, for assaulting a police officer in Admiralty Centre on 1 December 2014. Three people were sentenced to three and a half months in prison each for breaking into Legco on 19 November 2014, and this on government appeal (they were originally sentenced to community service). 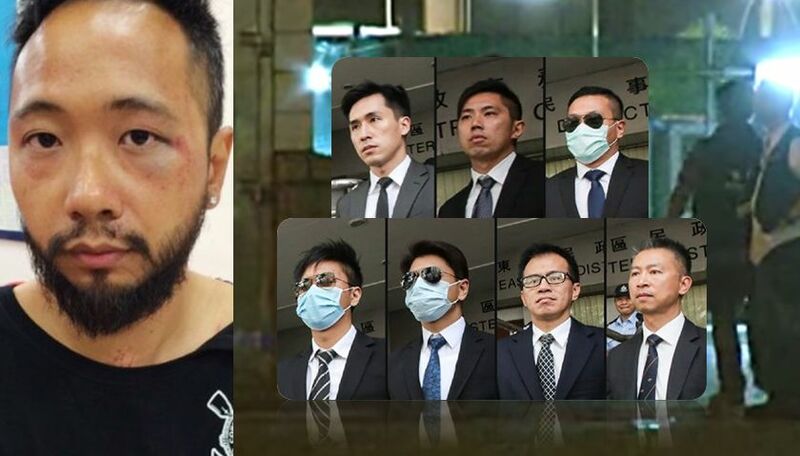 Ken Tsang, the victim of the infamous “dark corner” police beating broadcast on television, was sentenced to five weeks in prison for assaulting officers and resisting arrest. The total amount of prison time to which demonstrators were sentenced was one year, nine months and three weeks. Ken Tsang and the policemen convicted of beating him. Up to that point, the Chinese Communist Party and the Hong Kong government had constantly referred to the “illegal Occupy movement” in their propaganda but were having very limited success proving that illegality in Hong Kong courts. In fact, eight police officers have been sentenced to more prison time for crimes committed while policing the Umbrella Movement than all protesters put together. The seven officers convicted of beating Ken Tsang received two years in prison each, amounting to 14 years total. An eighth officer, Frankly Chu, was sentenced to three months in prison in a separate case. In all, police officers were sentenced to 14 years and three months. The trial of Joshua Wong, Nathan Law and Alex Chow for occupying Civic Square on 26 September 2014, triggering the start of the Umbrella Movement two days later, was only one of two Umbrella Movement-related trials to begin in 2016. It started in February and concluded in August. It was not the first post-Umbrella prosecution of pro-democracy leaders, but it was the first related to the Umbrella Movement. Still, people didn’t seem too worried because, after all, the offence with which they were charged, unlawful assembly, was non-violent and usually punished by a sentence of community service and/or a fine. Indeed, Wong and Law received community service sentences and the judge accommodated Chow’s desire to study abroad by giving him a suspended prison sentence. But then the Hong Kong government appealed the sentences, and it began to appear that something new was afoot, especially in late 2016, when the number of prosecutions of pro-democracy leaders started to increase. The violence between police and protesters in Mong Kok during the Chinese New Year in 2016 appeared to embolden the government to pursue prosecutions using the blanket argument that protests of all kinds, including nonviolent ones, endangered law and order. The Mong Kok unrest. Photo: Joel Christian. But the prosecutions of pro-democracy leaders were not only related to protests. In September 2016, new and young candidates did impressively well in Legislative Council elections. 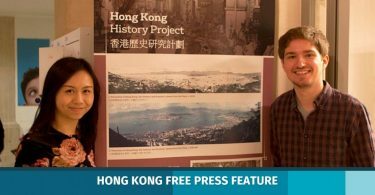 This development, along with the rise in calls for self-determination and independence, seemed to have alarmed the Party and Hong Kong government, spurring them to take action. They almost immediately initiated disqualification proceedings against six pro-democracy Legco members (five newly elected, one re-elected) and the prosecutions of pro-democracy Legco members and other leaders of political parties and student organizations increased rapidly. In April 2017, over two years after the end of the movement, charges were brought against the Umbrella Movement nine, essentially for “inciting” the 79-day-long occupations. I began to document a clear pattern of the Hong Kong government targeting leaders of pro-democracy political parties and student organizations for prosecution. Up to now, 26 pro-democracy leaders have faced 40 different legal cases since the Umbrella Movement. Most of the prosecutions started in late 2016. In January this year, I previewed a series of upcoming trials and have tracked those trials since. It was not only pro-democracy leaders but also ordinary activists who were prosecuted, the latter in batches of a dozen or more at a time. Numbers ballooned. In January, there were six trials of 43 defendants; in February, six of 27; in March, eight of 46; in April, five of 27; and in May, three of 21. Since the start of 2018, more than three years after the Umbrella Movement concluded, there have been four movement-related trials of 47 defendants, sending the overall number of those tried to at least 266 and the number convicted to at least 100. It’s not over yet. 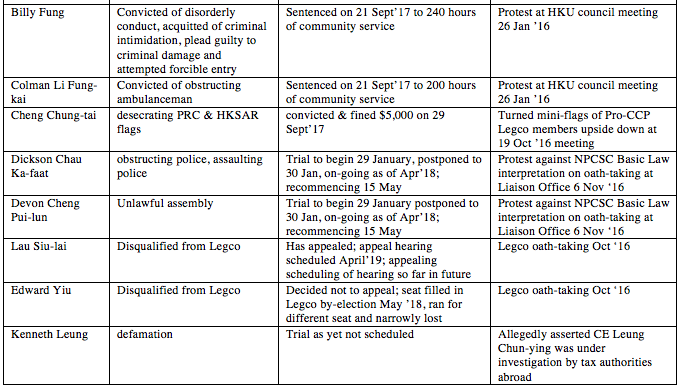 There are at least ten on-going or yet-to-begin trials involving 53 defendants, with big ones scheduled in May (the Mong Kok 15), July (the Liaison Office nine), September (the NENT 13), and November (the Umbrella Movement nine), and there may be new cases to come (for example, Democratic Party Legco member Ted Hui was recently arrested). What has happened so far and what conclusions can be drawn? Put simply, Hong Kong has never seen anything like this before, so many people in the pro-democracy movement put on trial over such an extended period of time for such a wide array of crimes. One would have to look to places like Turkey or Venezuela to find comparable instances of prosecutions being used as a key weapon against political enemies. In addition to at least 266 prosecuted in relation to the Umbrella Movement, there have been dozens of others, including at least 27 for protesting, 13 for carrying out their duties as Legislative Council members, and at least two for other reasons. 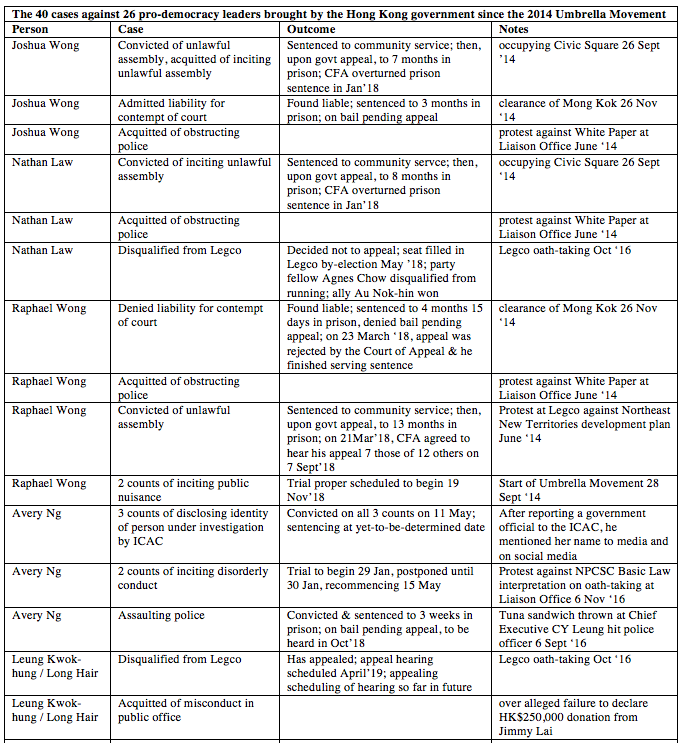 Of those 26 pro-democracy leaders, 12 are Legco members, who have faced 18 different cases. There are currently 25 pro-democracy Legco members. Prior to the disqualification of six, there were 29. Of that latter number of 29, more than a third have faced judicial proceedings. 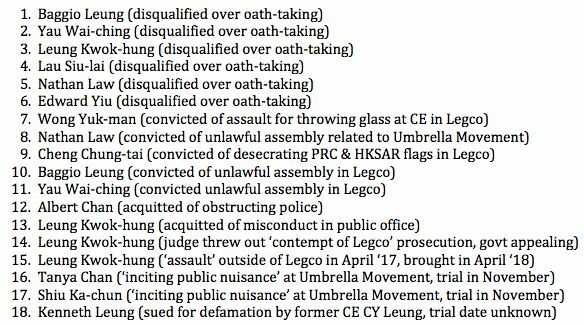 And of those 18 cases, 13 related to actions taken or words spoken by Legco members while carrying out their duties as elected representatives, as opposed to — say — taking part in street protests or engaging in entirely unrelated activity. 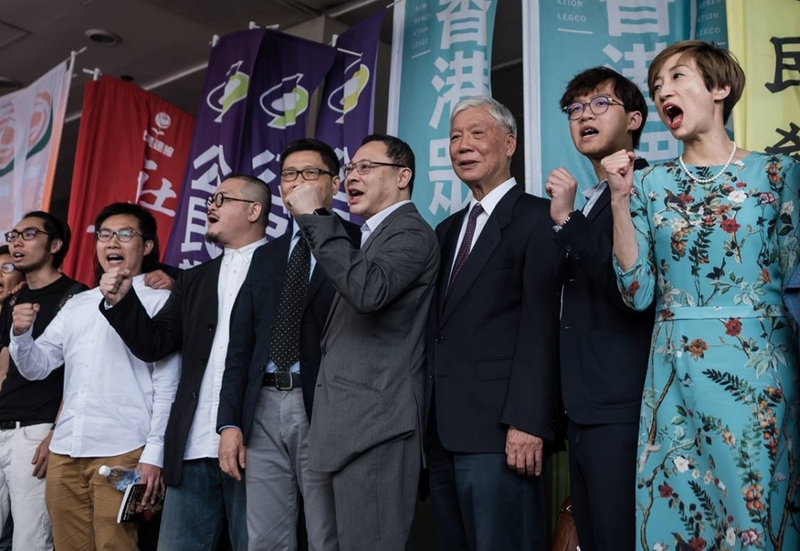 The list of 26 pro-democracy leaders also includes ten leaders of student organizations and five leaders of political parties who are not Legco members. 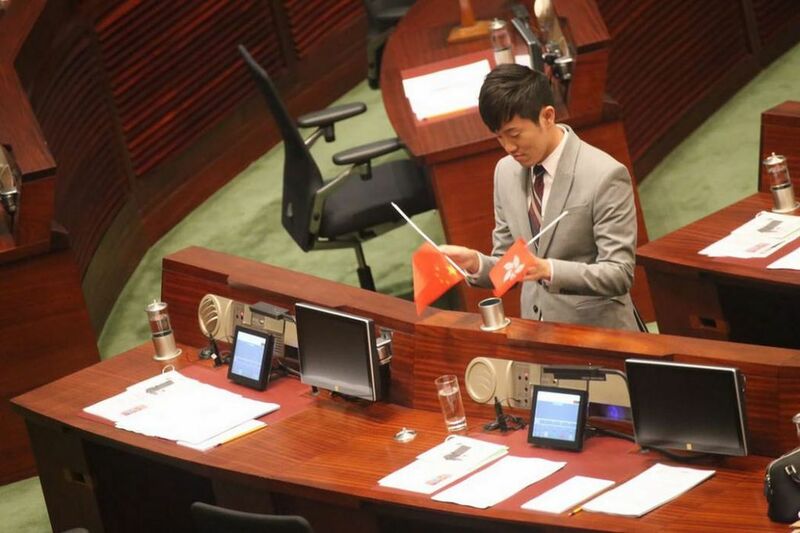 The discrepancy in the totals — 12 Legco members + 10 student leaders + 5 political party leaders = 27 versus 26 pro-democracy leaders total — is because one Legco member, Nathan Law, was previously a leader of the Hong Kong Federation of Students. Many of those targeted have been young people. In the “batch trials” — the Mong Kok 20, Mong Kok 15, NENT 13, and Liaison Office nine — the vast majority of defendants are young people. The Umbrella Movement nine, with only two young defendants, is the only batch trial that doesn’t fit this pattern. All of these are related to protests. Two political parties have been singled out for targeting: Demosistō and League of Social Democrats have had, respectively, 10 and 11 leaders and core members on trial. 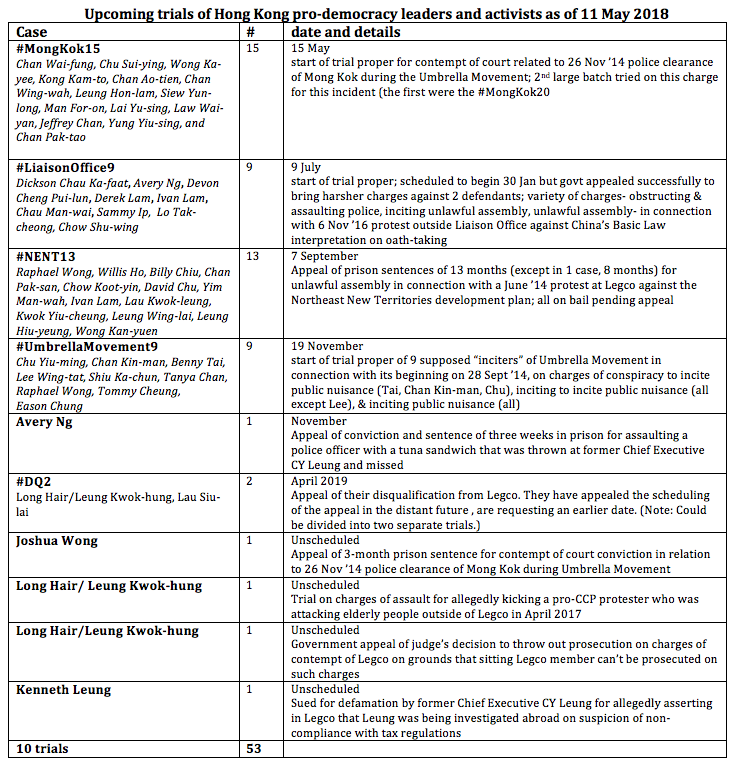 Individuals targeted for multiple prosecutions include Long Hair (4*), Raphael Wong (4), Avery Ng (3), Joshua Wong (3), Nathan Law (3*), Ivan Lam (2), Derek Lam (2), Baggio Leung (2*), and Yau Wai-ching (2*). (The asterisks denote numbers that include a disqualification from Legco, which is not a criminal prosecution.) All of those individuals except the last two belong to Demosistō or LSD. 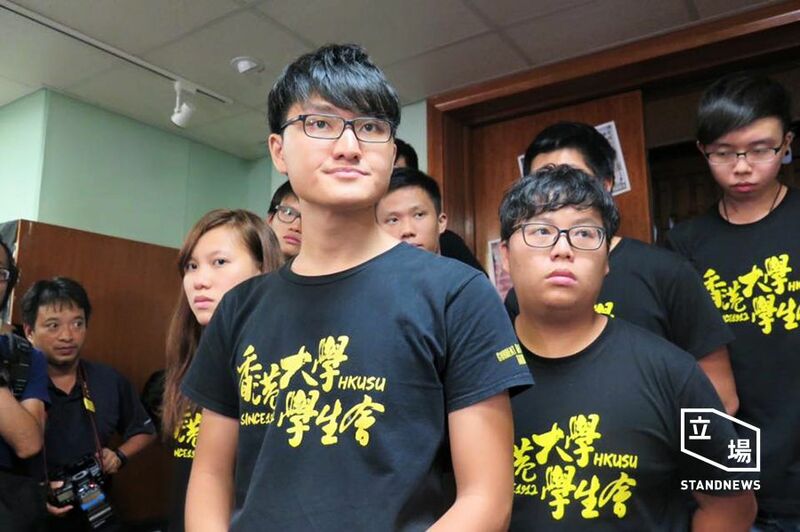 The three student leaders Joshua Wong, Nathan Law and Alex Chow. Photo: Demosistō via Facebook. The government’s success rate is checkered but looks to be improving. In the early phase of Umbrella Movement trials up to the end of 2015, its record was poor, with convictions in only 74 of 216 prosecutions, or about 34 percent, significantly under the overall conviction rate of about 50 percent for 2014, which itself has been criticized by law-and-order types. But since the Civic Square three case which started in February 2016, its Umbrella Movement record has improved considerably: 23 out of 24 convictions. 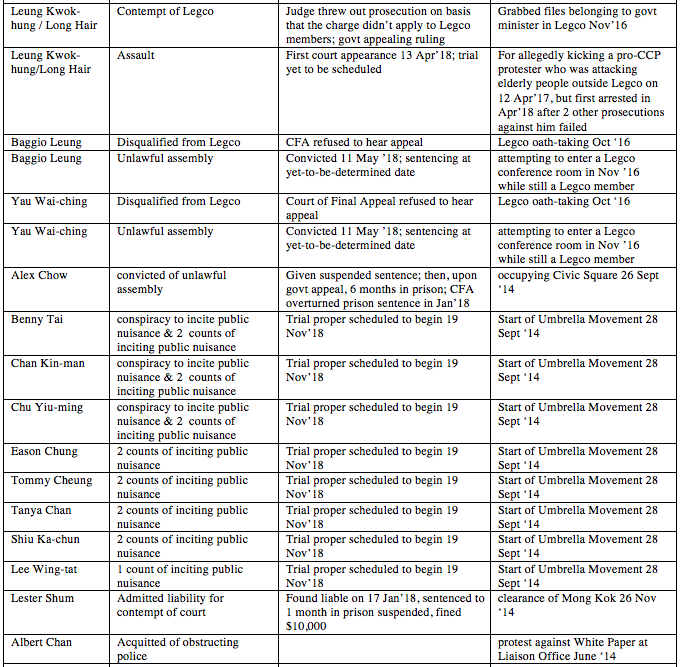 Its record in other cases has improved as well, with, for example, all 13 of the NENT 13 sentenced to the longest prison terms in living memory for unlawful assembly (their appeal will be heard in September), and 19 successful cases against pro-democracy leaders, resulting in either convictions or disqualifications (versus seven unsuccessful cases). The World Justice Project ranks Hong Kong 16th out of 113 countries in its 2017–2018 Rule of Law Index. In its 2017 report on Hong Kong, the European Union concluded, “The rule of law prevailed and the judiciary continued to demonstrate its independence and consistent respect for due process.” Are these assessments not unjustifiably sanguine? The introduction by the High Court of harsher sentencing guidelines for nonviolent protesters convicted of unlawful assembly, which may result in more protesters going to prison in the future, and appears to blame nonviolent protesters for any violence which may occur where they are present. All of these developments have occurred within the last year and a half. There has been a steady barrage of bad news about rule of law in Hong Kong. Overall, the Party and Hong Kong government are trying to bend the law in a more authoritarian direction and have had some success in persuading the courts to go along with them. This is toxic not only to the rule of law but also to politics and society’s sense of fairness and decency. In light of this grim picture, what do such observers as those mentioned above mean when they say rule of law remains robust in Hong Kong? 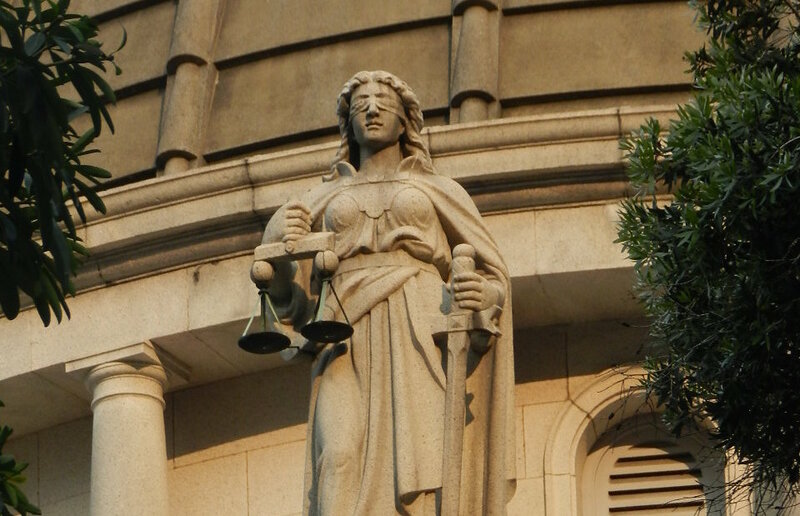 Statue of Themis on the Old Supreme Court Building. Photo: Wikimedia. It is true that in non-political areas, rule of law continues to function well and due process is widely respected. The judiciary remains generally quite independent, notwithstanding the influence on it, especially at the High Court, by the constant pressure of propaganda, the Party’s interventions, and non-stop prosecutions. But an assessment that rule of law in Hong Kong is just fine fails to take seriously the prospects when a government begins to employ the courts toward political ends or acts outside of the law and refuses to be held accountable. 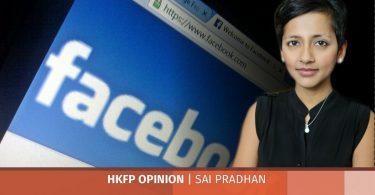 Surely, this is a sign of a deterioration in respect for rule of law, the beginning of its undermining, and a drift toward Communist-style “rule by law”, made all the more troubling by the fact that the Hong Kong government, like the Party, constantly invokes “rule of law” to defend its actions. Indeed, this ritual justification, “acting in accordance with the rule of law”, appears to have a hypnotic effect on a great many observers, bamboozling them into complacency or somnolence: Oh, well, if it’s done in accordance with rule of law — and Hong Kong does have robust rule of law, lest we forget — then, well, even if we don’t like it, that’s just the way it is. Likewise, the steady drip-drip-drip of one prosecution after another is intended to fly under the radar. To understand the full breadth of the crackdown on democracy and the mainlandization of Hong Kong, and therefore, also the threat to the rule of law, one must comprehend the full picture. Far from being only “fringe” issues, using the legal system to attack political opponents and the multiple infringements on the “one country, two systems” principle are the canaries in the coalmine, and based on those criteria, alarm bells should be sounding loudly. And unsubstantiated declarations that certain speech is “against the Basic Law” as justification for attacks on perceived enemies. In all of these cases, the government has invoked both rule of law and the Basic Law to justify its actions, but a clear pattern emerges of the Hong Kong government employing law as a means to attack its political enemies. While the Chinese Communist Party and Hong Kong government continue to deny to the people of Hong Kong basic human rights, such as the right of self-determination and the right to genuine universal suffrage, they are further restricting other basic rights such as freedoms of expression and of assembly, the right to run in elections and to hold elected public office, and the right to vote in free and fair elections. ultimately creating a political environment in Hong Kong that more closely resembles that of the mainland. The following review is not exhaustive and focuses primarily on cases of the past year or so. In addition to the cases against pro-democracy leaders and activists discussed in this article, there have also been major trials of other political opponents, in particular of dozens for their involvement in clashes between police and protesters during Chinese New Year 2016 in Mong Kok. outcomes: All six were disqualified, Leung and Yau on 15 November 2016, the other four on 14 July 2017. Leung and Yau appealed first to the Court of Appeal and then to the Court of Final Appeal. Both courts rejected their appeals. Of the other four, Nathan Law and Edward Yiu decided not to appeal while Long Hair and Lau have appealed. Long Hair and Lau’s appeals have been scheduled for April 2019 but they are seeking an earlier date. By-elections to fill the four other seats were held in March 2018.
significance: These cases were precedent-setting in three respects. First, the government had never previously attempted to use the courts to get elected Legco members disqualified. Second, while the first case, against Leung and Yau, was on-going, the National People’s Congress Standing Committee issued an “interpretation” of the Basic Law article regarding oath-taking. The purpose of the interpretation was to give the High Court no other recourse but to disqualify the six. It was one of the few cases of the NPCSC intervening in Hong Kong court proceedings since the 1997 handover, and the only intervention while a case was on-going. Third, the High Court judge entirely disregarded the popular will. In all, over 180,000 people voted for the six. Their votes were effectively cancelled out by the judge’s ruling. 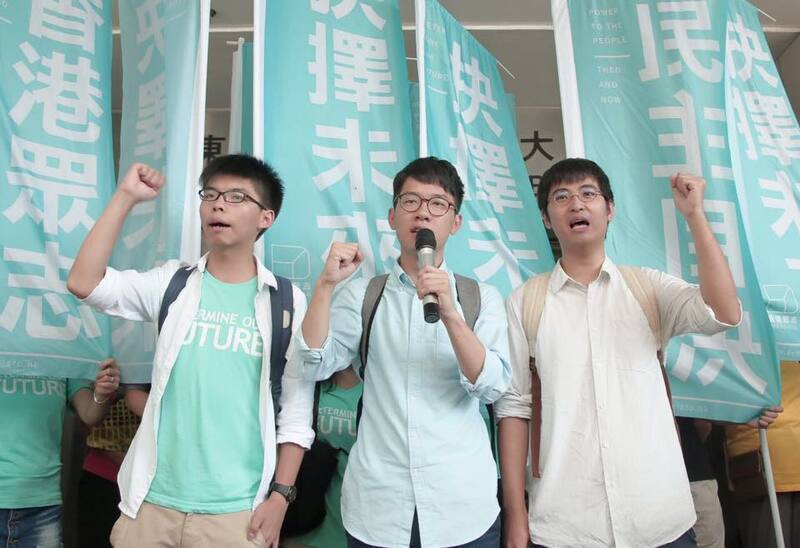 Joshua Wong, Alex Chow, Nathan Law. Photo: In-Media. outcome: Wong was convicted of unlawful assembly and acquitted of inciting unlawful assembly. Law and Chow were convicted of the charges against them. The magistrate sentenced Wong and Law to, respectively, 80 and 120 hours of community service and, upon his request, Chow to a suspended three-week prison term so that he could complete his studies abroad. The government appealed the sentences. The Court of Appeal sentenced Law to eight months in prison, Wong to seven and Chow to six and imposed stricter sentencing guidelines for future cases similar in nature. The Court of Final Appeal overturned the prison sentences but upheld the stricter sentencing guidelines. significance: Apart from the fact that three young leaders of the Umbrella Movement were aggressively prosecuted for a nonviolent offense, which in itself should be a warning sign, what is at issue is how to punish “unlawful assembly”. Up to now, it has been punished with suspended sentences and/or community service and/or a fine, or, at most, a short prison term of perhaps three weeks. The Court of Final Appeal overturned the prison sentences of the Civic Square three but ruled that harsh new sentencing guidelines imposed by the Court of Appeal were justified. The ruling is ominous insofar as it endorsed harsher prison sentences in the future for convictions on nonviolent unlawful assembly charges at assemblies where “violence” or “disorder” occurrs, apparently regardless of whether or not the violence or disorder were committed by the defendants. The Hong Kong government was widely criticized for aggressively pursuing its appeal of the original sentencing. The defendants are victims of double jeopardy, having fully served their community service sentences (in the cases of Wong and Law) and then having served time in prison until they were bailed while awaiting appeal. Neither the courts nor the Hong Kong government have raised the issue of any kind of reparations for this egregious breach of rights. For these reasons, this case has clearly negative implications for the right of freedom of assembly. The NENT activists outside court. Photo: Inmediahk.net. outcome: All were acquitted of attempted forcible entry but found guilty of unlawful assembly and originally sentenced to community service. Leung Hiu-yeung was found guilty of obstructing a police officer. Upon government appeal of the sentences, the High Court sentenced 12 to 13 months in prison and 1 to eight months in prison. The Court of Final Appeal has agreed to hear their appeal, but not until 7 September. All are out on bail pending appeal, but some served up to six months in prison before being bailed. significance: This was one of the first big post-Umbrella cases. It is only one of two related to an incident that occurred before the Umbrella Movement. 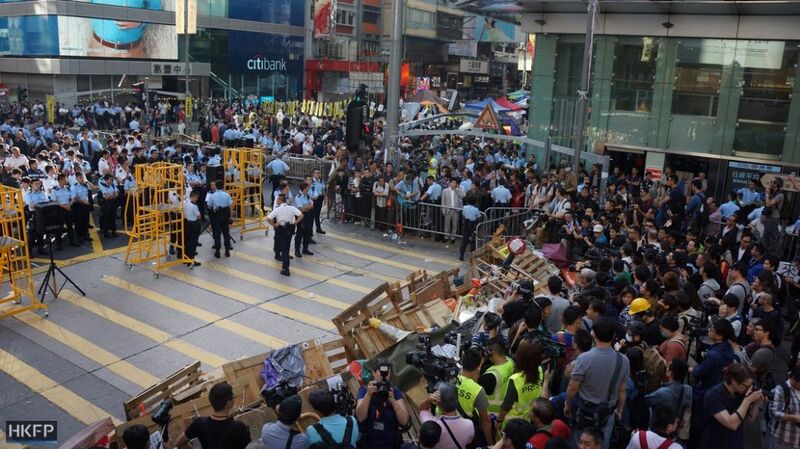 The harsh prison sentences of 13 months for the nonviolent offense of unlawful assembly are similar to those in the case of the Civic Square three. They were by far the harshest ever handed down by a Hong Kong court for that offense. 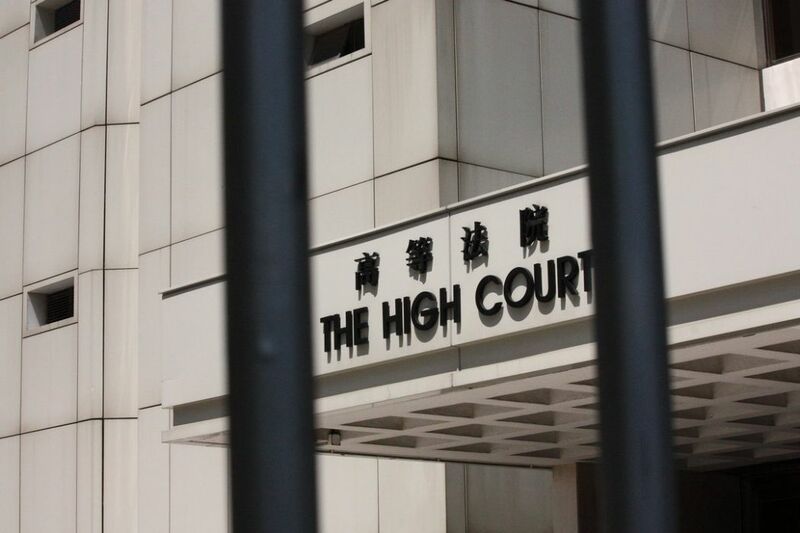 The cases indicate that the High Court appears to take a different view of the crime of unlawful assembly from that previously held by the Hong Kong judiciary. Like the Civic Square three case, there is also the matter of new sentencing guidelines being imposed retroactively. It is this which the Court of Final Appeal will consider in the September appeal, but given that it could find there was more “violence” at this protest, it might not reach the same verdict. Standoff between police and protesters during the clearance of the Occupy protest site in Mong Kok. Photo: HKFP/Tom Grundy. defendants: Joshua Wong, Lester Shum, Raphael Wong, Chau Wan-ying, Chu Wai-lun, Chu Pui-yan, Kwok Yeung-yuk, Chiu Chi-sum, Chan Po-ying, Cheung Kai-hong, Kwan Siu-wang, Hung Cheuk-lun, Fung Kai-hei, Choi Tat-shing, Jason Szeto Tse-long, Mak Ying-sheung, Cheung Kai-yin, Ma Po-kwan, Wong Lai-wan, Yeung Ho-wah. outcome: All 20 were found liable on 17 January 17 2018. 9 had pleaded liable, 11 had pleaded not liable. 17 were fined between HK$10,000 and HK$15,000 and given suspended prison sentences of between four and six weeks. one was not fined. 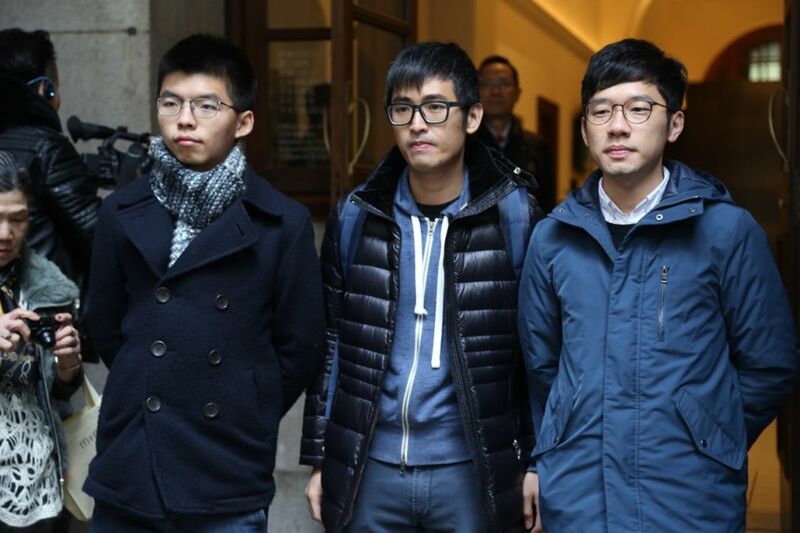 Joshua Wong was sentenced to three months in prison, Raphael Wong to four months and 15 days. On March 23, the Court of Appeal rejected Raphael Wong’s appeal and sent him back to prison to serve out his sentence. On April 16, he was released after having completed his sentence (with the usual discount for good behaviour). Joshua Wong was granted bail pending appeal and is currently awaiting a court date. significance: In terms of number of defendants, this is the largest single trial related to the Umbrella Movement. It was also the first time anyone in Hong Kong had been tried and imprisoned for contempt of court in relation to a street protest. 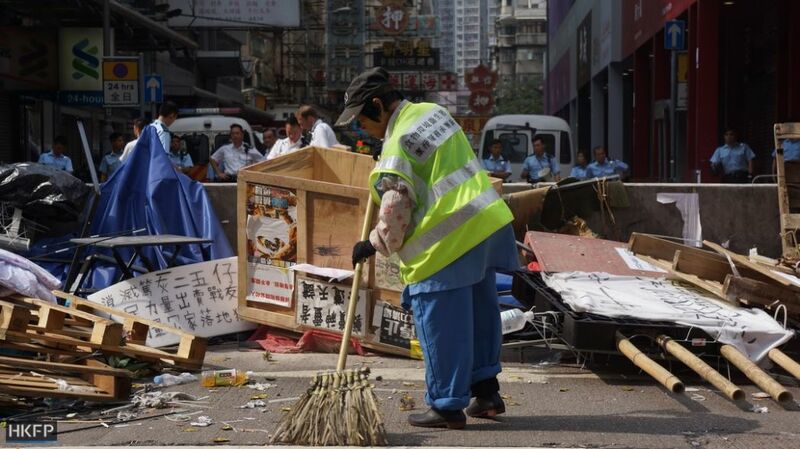 A street sweeper at the Occupy protest site in Mong Kok. Photo: HKFP/Tom Grundy. outcome: Trial proper scheduled to begin on May 15. 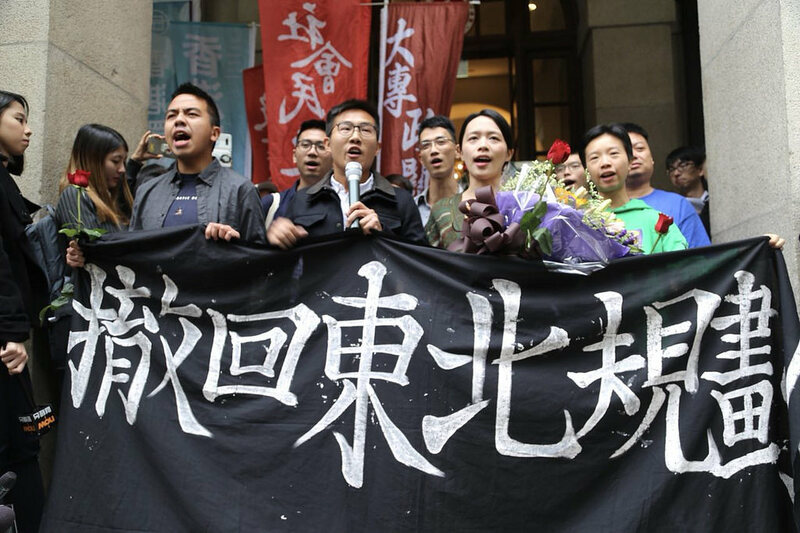 Seven of the 15 defendants have announced their intention to plead liable: Chan Wai-fung, Chu Sui-ying, Wong Ka-yee, Kong Kam-to, Chan Ao-tien, Chan Wing-wah and Leung Hon-lam. Seven others have said they will plead not liable: Siew Yun-long, Lai Yu-sing, Law Wai-yan, Jeffrey Chan, Yung Yiu-sing, and Chan Pak-tao. An arrest warrant was issued for Man For-on who did not appear at pre-trial review hearings. significance: See the Mong Kok 20 case above. Given the trials’ unprecedented nature, the bar for contempt was set far too low: The judge in the Mong Kok 20 case essentially defined being present as adequate grounds for contempt. Surely, active interference or obstruction in the clearance would have been more appropriate grounds, in which case none of the defendants would have been found guilty. Surely as long as they do not interfere or obstruct, citizens must have the legal right to observe police actions taken in public. All of the above cases (the Civic Square three, the NENT 13, the Mong Kok 20 and the Mong Kok 15) are being tried in the High Court, which appears to have a much less sympathetic view of citizens protesting nonviolently than the magistrates’ courts. The nine defendants of the Occupy case. Photo: Tommy Cheung, via Facebook. significance: This case is basically intended to place legal blame on these nine for starting the Umbrella Movement on 28 September 2014, a ridiculous notion to anyone who saw how it actually unfolded. The trial proper is scheduled to begin more than four years after the start of the movement. The government only brought charges in April 2017. 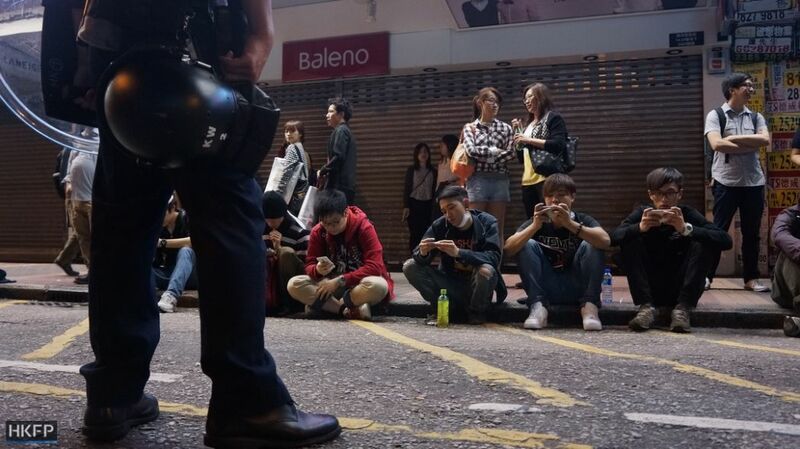 It has resorted to “inciting public nuisance” charges rarely used in Hong Kong and non-statutory, meaning they are not in the Crimes Ordinance but only in common law. No one in living memory has been charged with “public nuisance”. Five of the defendants are from Occupy Central with Love and Peace and Hong Kong Federation of Students, two of the leading groups of the Umbrella Movement, but strikingly, what both groups have in common is that on the night of 28 September 2014, rather than “incite”, they actually called on demonstrators to leave and go home, fearing that the police would escalate from teargas to the use of live ammunition. 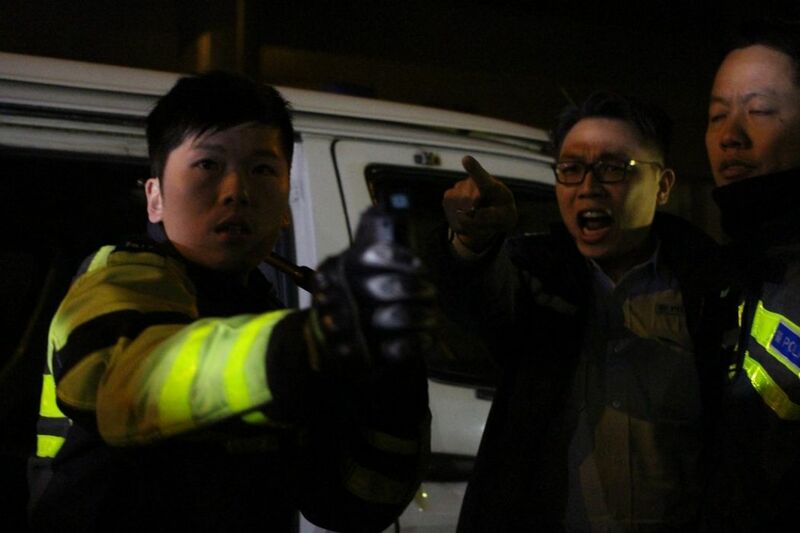 Of the other four, three, Lee Wing-tat, Raphael Wong and Shiu Ka-chun, appear to have played negligible roles, while Tanya Chan repeatedly beseeched demonstrators to be calm, rational and peaceful and avoid impulsive actions which they might later regret — pretty much the opposite of “incitement”. The Umbrella Movement was started by the people, without a leader. It would be hard to find a single demonstrator who could report having participated due to having been “incited” to do so by any of the nine defendants. Ironically, the main “incitement” was the eight-hour-long teargas attack by Hong Kong police on Hong Kong citizens, to which people responded with spontaneous nonviolent outrage. But no member of either the Hong Kong government or police is on trial for that; indeed, no credible account of the decision-making behind it has been offered by police or government, no officially sanctioned investigation into it has ever been conducted, and no one has been held accountable. In a sense, with this case, the Hong Kong government is indirectly putting the people of Hong Kong on trial for “public nuisance”, since we are the “public nuisance” that these nine allegedly incited. Also, of the approximately 1,000 people arrested and 250 prosecuted in relation to the Umbrella Movement, not a single one has been arrested or prosecuted for “public nuisance”. 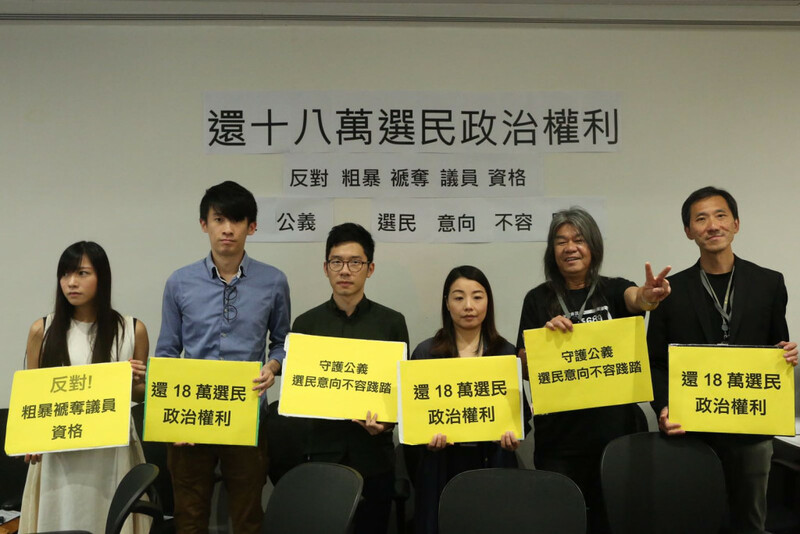 So the Hong Kong government is prosecuting these nine for inciting an offense which it has not legally demonstrated was ever committed. 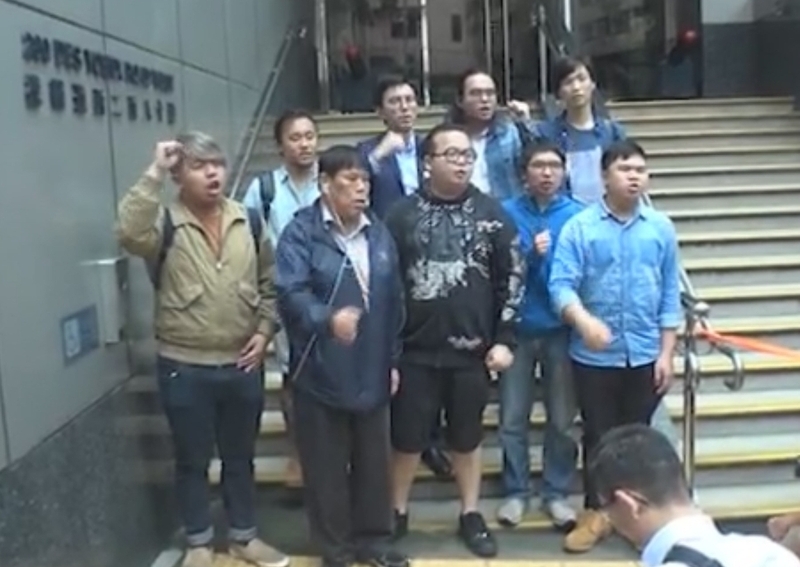 The nine activists met the press outside the Western Police Station. Photo: Apple Daily. significance: The nine are being prosecuted due to the location of the protest, the Liaison Office. Police are under orders to prevent any kind of disturbance from occurring there, tightly controlling passage in front of the building, supposedly in the name of the security. It appears that another objective is to discourage people from protesting there. Avery Ng is the only defendant arrested at the protest. The other eight were arrested at their homes two months later. The unlawful assembly charges are particularly peculiar since there were thousands of demonstrators, all presumably “unlawfully assembled” — so why these five, and why did it take months to arrest them? Two of the defendants are on trial in other cases as well. Ivan Lam was sentenced to 13 months in prison for unlawful assembly at the NENT protest and is out on bail pending appeal. 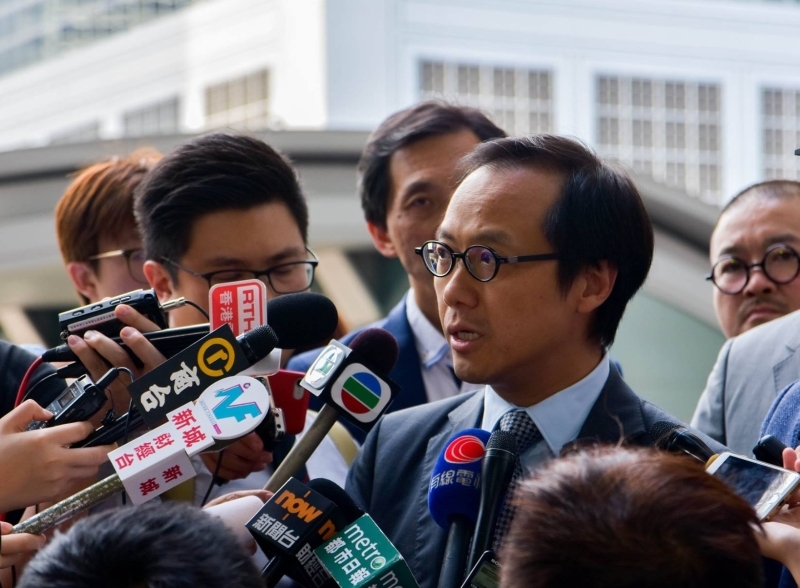 Avery Ng is appealing an assault conviction and was recently convicted of three counts of disclosing the identity of a person under investigation by the Independent Commission Against Corruption. Most of the defendants are members of Demosistō or League of Social Democrats. One, Devon Cheng, is a former student leader. significance: Part of a pattern of prosecuting pro-democracy Legco members for actions taken in Legco. As Hong Kong Watch recently pointed out, this case is a perfect example of why the Public Order Ordinance needs to be reformed, as the United Nations and Human Rights Watch have been calling on the government to do for years. Leung and Yau were also disqualified from Legco over oath-taking, and Legco is now suing them to recover over HK$933,000 paid out to them while they were Legco members, which they claim was spent on legitimate expenses. Albert Chan. File photo: Tom Grundy, HKFP. significance: This was the first high-profile trial of pro-democracy leaders after the Umbrella Movement, though it was in relation to a small protest which preceded the movement by more than three months. The four were arrested 13 months after the incident, and after the Umbrella Movement, provoking suspicion that the prosecution was politically motivated. Comparing the not-guilty verdicts in this case to harsher verdicts in more recent cases, may suggest courts are hardening their attitudes toward protesters. Billy Fung (centre) and Colman Li (right). File photo: Stand News. outcome: Fung plead guilty to criminal damage and attempted forcible entry and was found guilty of disorderly conduct. He was acquitted of criminal intimidation. He was sentenced to 240 hours of community service. Li was found guilty of obstructing an ambulanceman. He was also sentenced to 240 hours of community service. While the government appeared disappointed they did not receive prison sentences, it said it would not appeal the sentencing. significance: Thee convictions are precedent-setting: the first time students have been found guilty of a crime in relation to on-campus political activity. charges: desecrating the flags of the HKSAR and PRC. significance: Part of a pattern of criminally prosecuting pro-democracy Legco members for actions taken in Legco. Leung Kwok Hung. Photo: inmediahk.net. significance: The government has decided to try to get rid of this perennial thorn in its side once and for all. 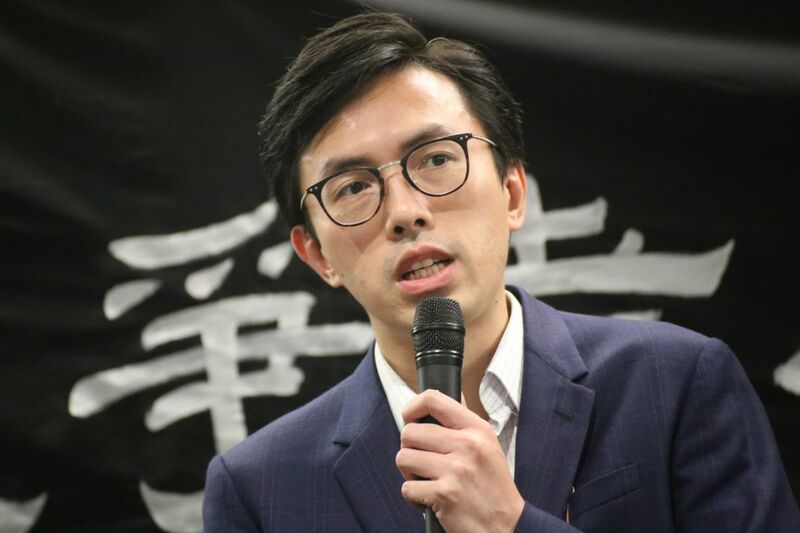 It has, in all, brought four cases against him, the three criminal prosecutions listed above plus his disqualification from Legco. 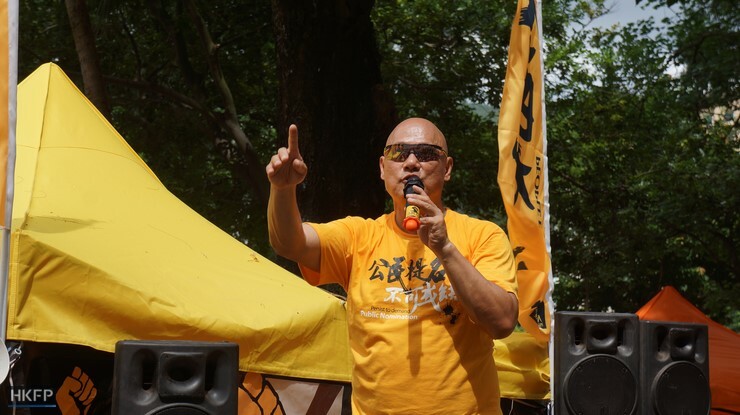 He vies with fellow League of Social Democrats party member Raphael Wong for the title of pro-democracy leader facing the most court cases — both have four. But of all pro-democracy leaders, Long Hair has also been the most successful so far in defending himself. He lost the disqualification case but was acquitted of one charge and had another prosecution thrown out. It was only after that that the government decided to charge him with assault — it appears it will just keep trying until it nails him. 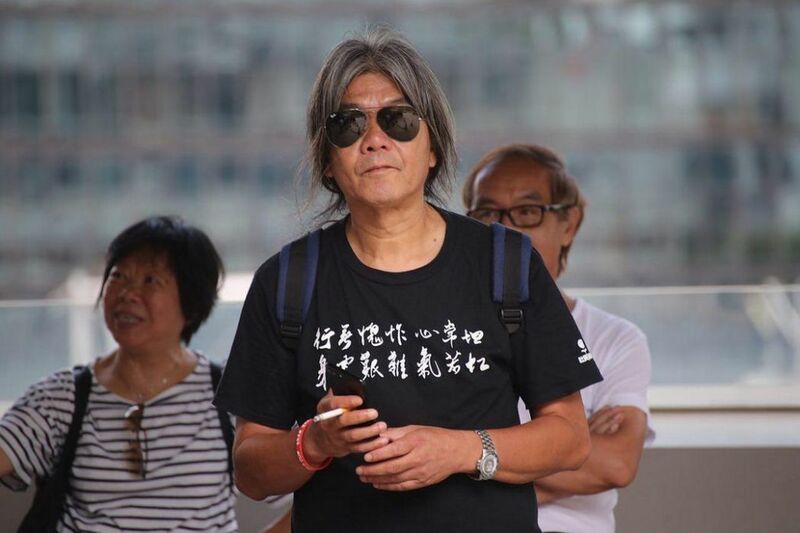 significance: Avery Ng is just behind his League of Social Democrats party fellows Long Hair and Raphael Wong, with three cases against him (they both have four). He has been convicted of throwing a tuna sandwich and mentioning the name of a government member under investigation for corruption, which was already in the media. Kenneth Leung. File Photo: Kenneth Leung, via Facebook. significance: This is the first time a Chief Executive has sued a Legco member for defamation.